Sam Durant. End White Supremacy, 2008. Electric sign with vinyl text, 96 x 136 in. Hammer Museum. Purchase. 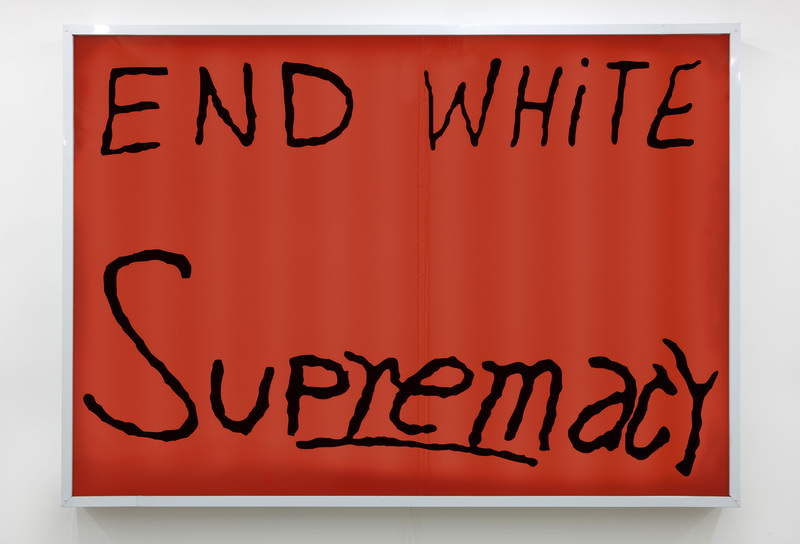 The Hammer recently added Los Angeles-based artist Sam Durant's light box End White Supremacy (2008) to the Hammer Contemporary Collection. For several years, Durant has used archival photographs of protests around the world as source material for both drawings and text-based pieces rendered as large-scale light boxes. The impassioned plea to "end white supremacy" was originally handwritten on a sign and carried during a civil rights protest in New York in 1963. By isolating the message articulated by the protester and putting it into a format typically used for commercial signage, the artist poses questions about the role of language and how meaning is constructed. In addition to the light box, we have purchased a related graphite drawing CORE (Congress of Racial Equality) Civil Rights Demonstration, New York, 1963 (index) (2009). Durant's work has been exhibited internationally at a number of institutions, including the Museum of Contemporary Art, Los Angeles; the Walker Center, Minneapolis; the Stedelijk Museum voor Actuele Kunst, Ghent; and Kunsthaus Graz, Austria. The museum also thanks the members of the Hammer Board of Overseers, who have supported the Hammer Contemporary Collection since its inception, and the Friends of the Graphic Arts and CARTA, whose dues support Grunwald Center acquisitions.